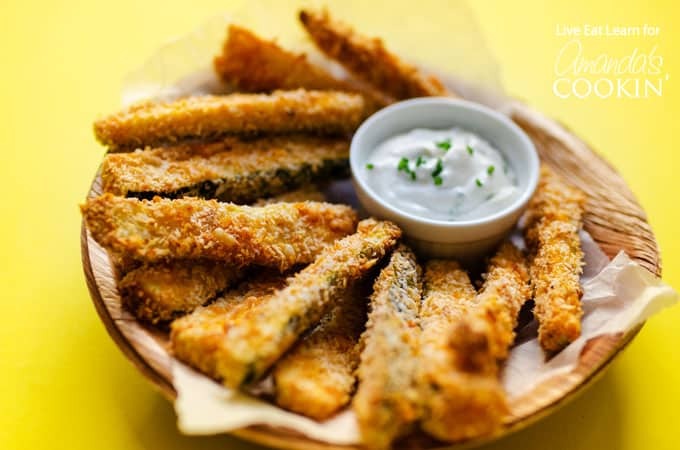 Zucchini Fries: crunchy, tender and healthy these zucchini fries have it all! 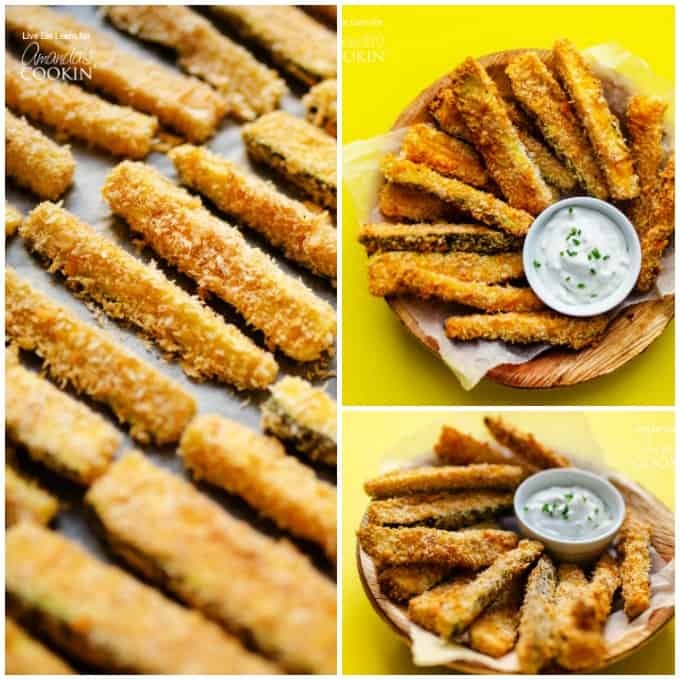 These Crispy Zucchini Fries are a healthy alternative to traditional French fries, but believe me when I say they don’t compromise on flavor at all! 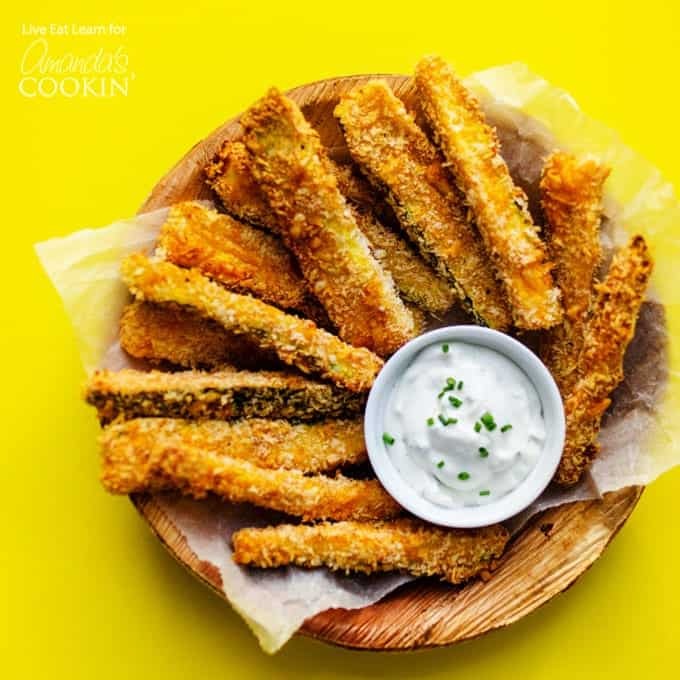 This recipe creates tender on the inside and crunchy goodness on the outside just like our Almond and Parmesan Crusted Asparagus Fries! Last but not least, serve these zucchini fries with a creamy gorgonzola dip that’s hard to put down. Panko is probably one of the most under-appreciated ingredients in your pantry. These Japanese breadcrumbs are light and airy and add the perfect crunch without weighing down whatever you’re cooking. 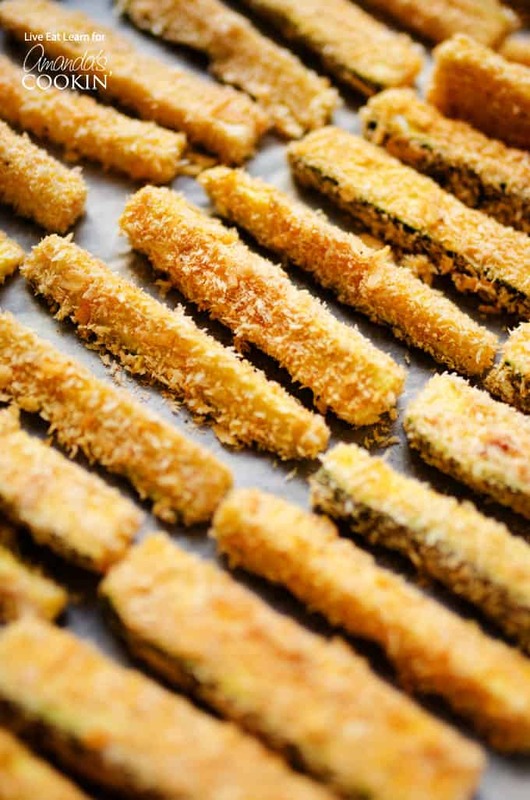 Case in point, these Crispy Zucchini Fries. They’re lightly coated with flour and egg then dredged in panko for the perfect amount of crisp. The panko takes away the need for frying, meaning you can bake these to healthy, crispy perfection! Obviously veggie fries (or any fries for that matter) are nothing without a good sauce. Like the time we made sweet potato fries with this avocado dipping sauce. Or wedges with this roasted garlic and rosemary sauce. Sauces matter, folks. Which is why today we’re pairing our crispy zucchini fries with a creamy, subtle gorgonzola dipping sauce. Just throw all the sauce ingredients in a food processor while your fries bake. It’s that simple! These crispy baked zucchini fries make a great game day appetizer or dinner side dish! Preheat oven to 425 degrees F. Cut zucchini in half lengthwise, then slice into roughly ½ inch wide by 4 inch long fries (no need to peel them). Combine panko, parmesan, salt, paprika, and pepper in a medium bowl. Place whisked eggs in a separate medium bowl, and the flour in a third medium bowl. Working in small batches, dip zucchini pieces into the flour, then the egg, then the panko. Set on a parchment paper-lined baking sheet. When all zucchini are breaded, bake for 15 to 20 minutes, or until golden and crispy. Meanwhile, add yogurt, gorgonzola, mayonnaise, and chives to a food processor and blitz until smooth. Season to taste with ground black pepper. Serve zucchini fries warm with dipping sauce. This post was originally published on this blog on Feb 11, 2018. Just made these for dinner. Yum! I have a suggestion to share that I learned years ago: it’s good to wash, slice, then soak zucchini and eggplant in saltwater. I usually soak eggplant overnight- but the zucchini, I just soaked for 30 minutes. Then you drain it and firmly press out the water using paper towels, or a cloth towel designated for this purpose (washed and dried without using fabric softener or dryer sheet). This removes the “bite” that eggplant and zucchini often have and allows them to be crunchier when baked. Great tip Donna, thank you so much for sharing!